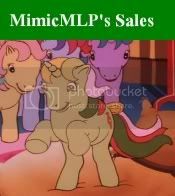 My Little Pony Arena » Forums » Special Interest Groups » Littlest Pet Shop » LPS Wish lists. Forums » Special Interest Groups » Littlest Pet Shop » LPS Wish lists. Posted: 0 Post subject: Re: LPS Wish lists. Here's the list of the ones I'm looking for, I can trade or buy. I don't have any older LPS to trade, but I if you're looking for any new releases I can check my local stores-Walmart, Kmart, Target, Meijer, etc. I also have G1 MLP's to trade, and I can also check stores for G3's. Ones in purple I really want! Loose is fine and I don't need any accessories. The way you spend each day adds up to the way you spend your life. Reference website for G1 LPS. Excellent refs! I would like to trade them for something on my Sale/Trade list. Please click the link in my siggy to see what i have for trade. Here's mine! It's VERY long, but it's the 300 pets I DON'T have! The ones I want the most are those I don't have. are these all up to date??? No CUSTOM should hit the trash can, They should be shipped to me hahahaha. Rescue home for on wanted customs. -carry case with the Chinchilla! i'm looking for more giraffes... older ones. i have the post card one, and the ones that came out recently with the water dish with umbrella, i have both green and pink water dishes. i have them MOC, so one open one, would be cool. Wings of Leather are my shelter but the breath of fire is opening my heart. I am willing to trade G3 ponies, G2 littlest pet shops or i will pay good money to find these sets IN THE NEXT FEW DAYS I WILL BE CATALOG-ING MY G3 PONIES AND WILL HAVE A TRADE LIST UP SOON. -zoo playset -just the outside case i am missing the purple door on the left and the blue door on the right, and have no connecting pieces left lol. -sparkling pond twinkling sledding party ( i am missing the sled, the bunny and the grey and white dog, so those pieces i am interested in).